Twenty people gathered for an information session on Saturday, September 20, to learn about the Green Classroom and how it works. They came from a variety of different backgrounds. Teachers, neighbors, students, and Becker family members were introduced to the garden’s unique roll at Becker and in Austin. They were also given a tour of the garden, then treated to a Q&A session. Thai Fresh provided breakfast burritos and tasty pastries for attendees to enjoy. And, yes, they really enjoyed them. Once Over Coffee Bar provided coffee to help jump-start the morning. Both Thai Fresh and Once Over are neighborhood shops who support Becker Elementary by donating food and drink. And, we really appreciate them! 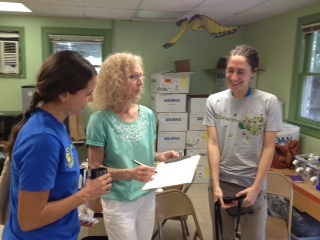 Several attendees signed up to be volunteer garden teachers. And, so, the Green Classroom will continue to share the wonders of gardening with the students of Becker Elementary. Thank you!